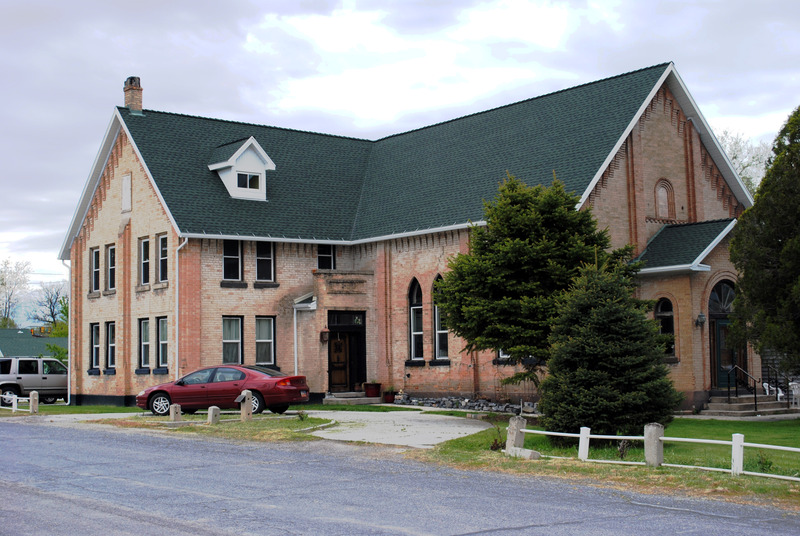 The original rectangular chapel (with the gothic windows) was built in 1894 at Lehi Junction where two rail lines converged. By 1903 this became the Lehi 3rd Ward. In 1917 the cross-wing addition at the left side of the photo was built almost doubling the size of the building. A 1936 renovation involved painting the exterior brick and adding the single-story foyer vestibule on the right side of this photo. This was the entry into the original chapel. By 1943 the ward membership had grown to eight hundred. As a result a new and much larger building was built several blocks east of this building. In 1953 the entire building was sold and used as a private residence. The current owners are the second owners since the church sold the building. By the time the current owners purchased the home, the windows had been broken out by vandals and the old chapel had been used as a woodworking/machine shop. The original flooring still remains, although there is an oil spill on the wood floor from the shop. This space is now a living room for the present family where a loft has also been added. There are two gothic arched doors from the Lehi 4th Ward rostrum that were bought by the family and installed in this living room as well. One door is on the main floor and the other is at the loft level. Dormers were added to the north wing, and the exterior brick was stripped of its paint and restored to the original state. This is the only historic LDS meetinghouse remaining in Lehi.